For this 150th post, and as we usher in a new year, I'd like to talk about my maternal grandmother. The above picture shows her blowing out the candles at her 90th birthday about a year and a half ago. On Saturday, November 27th, around 1am, she passed away quietly in her sleep, having suffered a heart attack about a week earlier that left her weak and barely conscious. She lasted just long enough for my uncle from Israel to see her alive, though at that point, I doubt there was much of her mind left. She did live a very full life, having traveled the world, raised three children, gotten her Master's degree while still a full-time mom, worked full-time as a social worker and then as a volunteer after her retirement, and lived in her own house until two and a half years ago despite my grandfather having passed away over 10 years ago. The obituaries that appeared in the Globe and Mail and in the Toronto Star hardly seem to do it justice. Savta, as I always called her, was born Rochelle Leah Goldstick to parents Edna and Edward Goldstick, both immigrants to Toronto from different parts of Europe to escape jewish persecution. She was an only child, and always resented this fact. Her mother was over-protective and her father was never satisfied with any of her accomplishments. As her dementia progressed over the last couple of years, she brought up these early years more and more often, since her childhood memories seemed more vivid than those formed more recently. She would tell again and again the stories of how she and her cousin Wilfred would walk all the way to High Park, much to the dismay of both their mothers, and how she was constantly compared to her cousin Shifra, who would always do better than her in school. She got her bachelor's degree in Social Work at the University of Toronto and worked for many years for the Toronto Catholic Children's Aid Society. She had the difficult job of taking children away from neglectful parents, but from what I hear, she was pretty good at it. She was always very tough. In the early '70s, she got her master's degree for purely financial reasons, since all these young people coming in with their graduate degrees were making more money than she was. It was right around this time that both her parents died. She married my grandfather, Israel Gang, right after WWII in 1946. She and Grandad had a very weird relationship. I get the impression that they married because they were both getting older and were worried about finding a mate. I mean, they certainly seemed to love each other, and were married for 54 years before my grandfather died in 2000, but they did fight a lot. Grandad was a bit of a grumpy guy and had trouble expressing his emotions, and Savta knew how to push all his buttons. However, they played Scrabble together almost every day, and when Grandad died, she refused to play the game with any of us because it was too painful. Savta was also an incredible knitter. She probably knit hundreds of sweaters and socks for herself and for everyone else in the family. 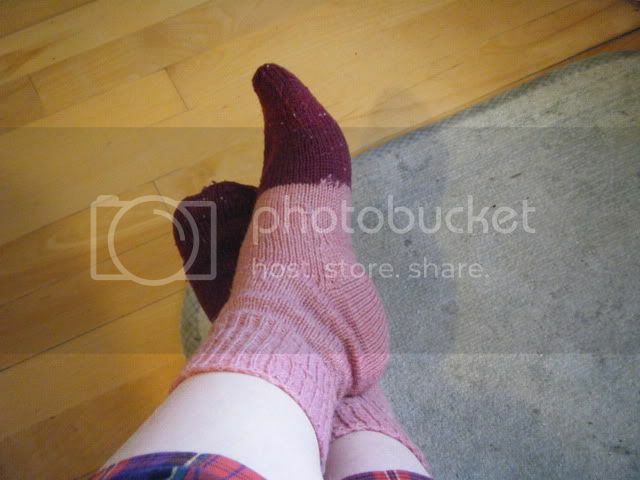 My uncle, Savta's middle child, absolutely loved her hand-knit socks and would wear nothing else. When Savta couldn't knit any more because of her vision problems, my aunt taught herself to knit so that she could make socks for my uncle. I inherited her handknit socks, most of which are a single colour, and some others are striped because she ran out of yarn. I know. It’s like she should have given Death the old one-two when he came for her. Oh well. She really loved you, sweetie, and I really love you, too. I feel truly honoured to have met this unforgettable woman, no matter how briefly.